My kids love butter fragrant fried rice and fried rice with egg & ham/sausage. These fried rice are very flavorful and they could eat a big plate. Although I'm cutting down food rich in carbohydrate, oil and butter etc., still I don't want to deprive them from stable menu ... perhaps a healthier version. 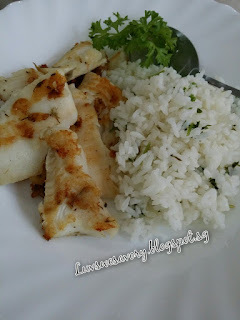 With lots of lime and lemon, fresh parsley and mixed dried herbs in the kitchen, I tried out this citrus flavor of lime juice mixed with cooked rice. When I was mixing the cooked rice in the saucepan with lime juice, the aromatic citrus and parsley fragrances really made me salivating. 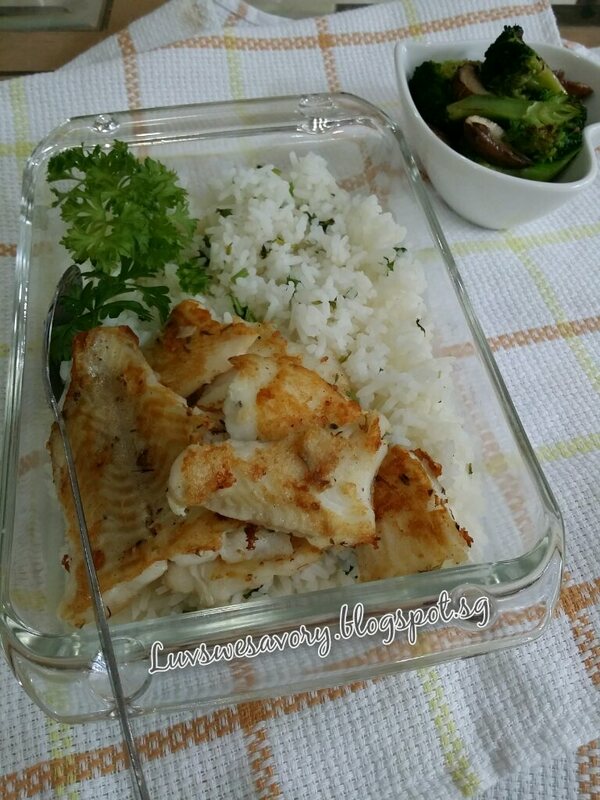 To pair with this tangy rice, I made some pan fried herb fish fillets in extra-virgin olive oil. 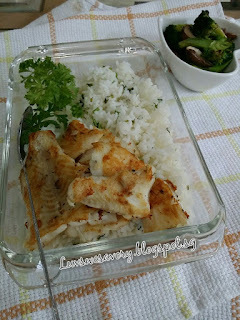 Below my modified version and served with pan fried fish fillets. 1 - 2 tablespoon Extra-virgin olive oil for pan frying the fillets. 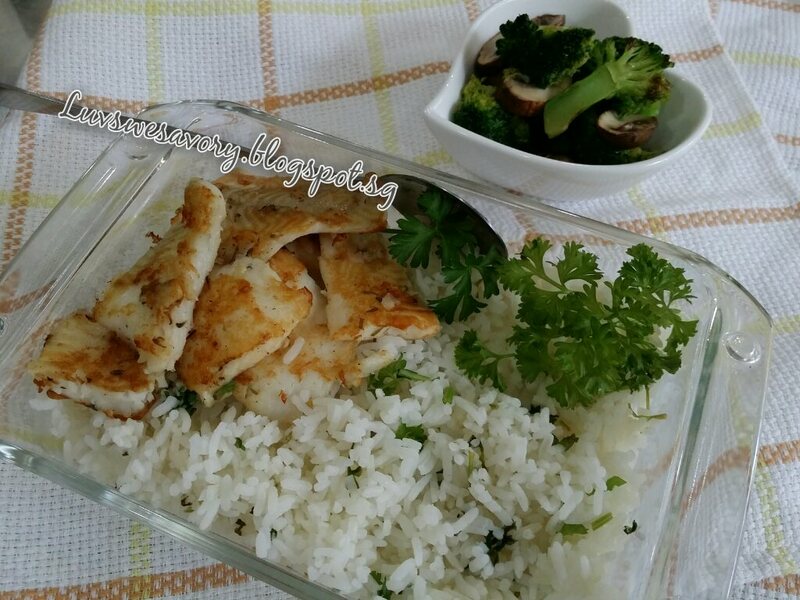 Cook the rice with rice cooker. Pat dry the fillets with kitchen towels. Season the fillets with mixed herbs, salt and pepper. Set aside and let the seasoning set in about 30 minutes. Heat a non-stick pan with medium heat. Add 1 tablespoon Extra-virgin olive oil and pan fried the fillets 2 - 3 minutes on both sides, lightly browned. In a saucepan over low-medium heat, combine the cooked rice with fresh lime juice and chopped fresh parsley. Quickly and gently mix well with a big wooden spoon for a few minutes. 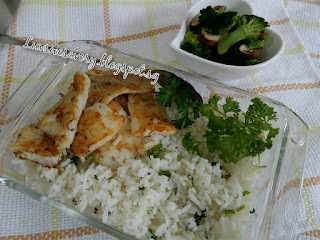 Serve immediately, spoon the desire amount of parsley lime rice with some pan fried herb fish fillets. Squeeze some lime juice over the fillets if you like. Even far from Subang Malaysia, I still can smell your fragrant tanggy appetizing fried rice!!! Good morning Karen. I can even smell your fragrant fried rice even thought I am sick with flu today. Good morning Cecilia, oh! you take care, speedy recovery ! Hi Karen, I'm going to cook this on weekend. Hi Karen, I absolutely adore all these flavors, what an amazing meal. Love it!! This is so appetising, Karen. Just the kind of food I love for dinner. Will try it soon!